presented by the Canadian Quilters Association. Nominated for Saidye Bronfman Award for Excellence in Fine Craft. Thirty Distinguished Quilt Artists of the World, Tokyo Dome, Japan Juried by Robert Shaw. Taught for Brother Sewing Machine in Nagoya, Japan. Chosen for 88 Quilt Leaders of the World. Nihon Vogue /Japan Handicraft Instructors Assoc. Honourary Life Membership: Mayflower Handquilters Society of Nova Scotia. Noted as 'collectable' in Financial Times article on investing in art quilts. Half hour documentary on the artist's work for ATV. Lecture to Council of 100 Fresno Art Museum, California. 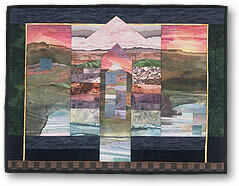 Curated show of 25 South African quilt artists for Houston Quilt Festival. "Valerie is a brilliant designer and colorist and an inspired teacher. She shares her enormous talents, opening doors to help students develop their own creative directions. Her landscapes are based on principles which will nurture artists of many varied media." " ..... Thank you so much for two fabulous workshops that had more people producing more finished ( and beautifully so, too) works than I have ever known to happen. As well the Guild was truly inspired by and very responsive to your deeply moving lecture." Carole Carpenter, Workshop Convenor, York Heritage Guild. Toronto. "You have a gift of apt, and concise and inspiring statements... landscape has become such an important context for creativity and for preservation." Radka Donnell, quiltmaker, author. Switzerland and U.S.A.
"Encouraging us to think of the scissors as the brush and the pool of fabric as stimulus and paint, Valerie gently helped us overcome self doubt and discover....creative abilities we had not dreamed we possessed." "Your professionalism, artistic ability, organizational skill and teaching ability is outstanding. You are extremely gifted with a true belief that you share so willingly with others." Louise and John Monteith, organizers, Academy of Creative Sewing, Canada.
" I don't remember anyone having such a strong effect on so many of us." "How to ever thank you for your most exceptional workshop... It was truly superb. Your patience, ease and knowledge permeated the group and the results were staggering! You pushed and inspired and the gals were ecstatic upon the workshop's conclusion." Beverley McInnis, Artist, teacher, organizer. Canada. "I have read every book out on landscapes and yours is the most inspirational. I really can't tell you what a joy it is. I have the feeling that your book has brought me close... to finding "who I am" as a quilter." T. G., New Jersey, U.S.A.
"I recommend it to my students as the best landscape primer around." Maxine Farkas, artist, teacher, curator. Lowell, Mass. U.S.A.
South Africa, rare flora and vibrant culture is a deep influence in my use of colour and love of the landscape form. miles below the Arctic circle. My precious bundle of African fabrics eased my transition to this frozen land. We also lived in Labrador before settling in Mahone Bay, Nova Scotia where we live in an 1850 farmhouse. I began making small appliquéd landscapes in 1981 and since 1984 have taught across North America, in South Africa, Japan, Germany, Northern Ireland, Scotland and England and on the faculty of Houston's International Quilt Festival since 1987. My first book "Beyond the Horizon: Small Appliqué Landscapes".C&T, 1995, is now out of print. I exhibit my work extensively through out Canada, United States. Also in Europe, Japan and South Africa. My work has been exhibited at International Quilt Festival since 1986 and frequently juried into both in "Hands All round: International Quilts" and "Tactile Architecture". In 2003 my work was chosen for "Thirty Distinguished Quilt Artists of the World", Tokyo Dome, Japan Juried by Robert Shaw. My quilts have been published in a dozen books including Fiberarts Design Book and have appeared in over 35 magazines such as "Quilter's Newsletter", "Fiberarts", "Art/Quilt Magazine", "American Quilter" and on the cover of "Patchwork Quilt Tsushin", Japan. I have also written essays and magazine articles for "American Quilter" and "Professional Quilter".